New Haven, CT – The DRFC traveled to New Haven last Saturday to take on Yale. The first XV would win 42-7 in a fiercely contested match, while the second XV completed a 57-0 shutout. Even a few development squad players got in on the action, capping off the day with a friendly game of sevens. The slick and muddy pitch could not dampen the team’s enthusiasm, but aggressive Yale play from the opening kick ended up pinning the Big Green inside its own 22 early. Decisive kicking and cohesive team play eventually moved the ball back into Yale territory where captain Pete Savarese managed to split the defense and open up the scoring. As the morning wore on, the Bulldogs grew increasingly chippy and Dartmouth was unafraid to reciprocate. A midfield confrontation saw a number of Big Green players defend a teammate as the half wound down and resulted in lock Hayden Aldredge receiving a yellow card. The official, however, also carded two Yale players and the Dartmouth backline took advantage of the mismatch, adding two more tries. Additionally, when Aldredge returned early in the second half, he befuddled the Yale defense for a 60 meter line break before setting up Parker once more. Parker’s final try, however, was the one to remember. Flyhalf Dawit Workie looked to quick tap a penalty at the Yale five-meter line but instead kicked a beautifully executed ball 35 meters across the pitch and just into the try-zone where a completely unmarked Parker caught it on the full and dotted it down. On defense the Big Green was staunch even when Yale threatened inside there 22 numerous times. Yale’s lone try was only the sixth that the Big Green has allowed in five Ivy League games. The 2nd XV were eager to share in that hard work as well. The afternoon match-up saw the much-heralded return of Chris Banks ’16, who last played, Hickie noted, “at the Junior World Championship in 2013.” Banks looked fit in New Haven, scoring the game’s first try and leveling the opposition at the ruck. A number of freshman players made their DRFC debuts on Saturday, including John Brady ’18 who looked right at home slicing up the Yale defense. The afternoon ended with a sevens game for some promising newcomers. The DRFC now prepares for next Saturday’s homecoming contest against Brown. The 1st XV will kickoff at 11 a.m. on Brophy Field. If you cannot attend the match, a link to a live stream of the action will be posted on the @dartmouthrugby Twitter account before kickoff. On another note, the Fall Board of Governors Meeting will take place on Sunday, October 19 at 10 a.m. at the Corey Ford Rugby Clubhouse. All DRFC alumni and Friends of the club are welcome to attend. 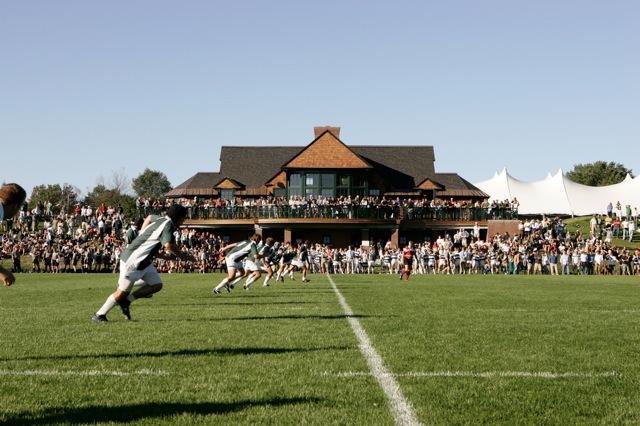 Dartmouth Rugby appreciates the longstanding support of our Alumni and Friends. Without this support, we would not be able to achieve the success we have enjoyed over the last six decades. We hope that we can continue to earn the support of all our Alums and Friends. To donate, please go to www.dartmouthrfc.com/support/ and click the "Support" button. Then select “Friends of Rugby” under the “Club Sports” section and fill in the required information to proceed to the billing page.